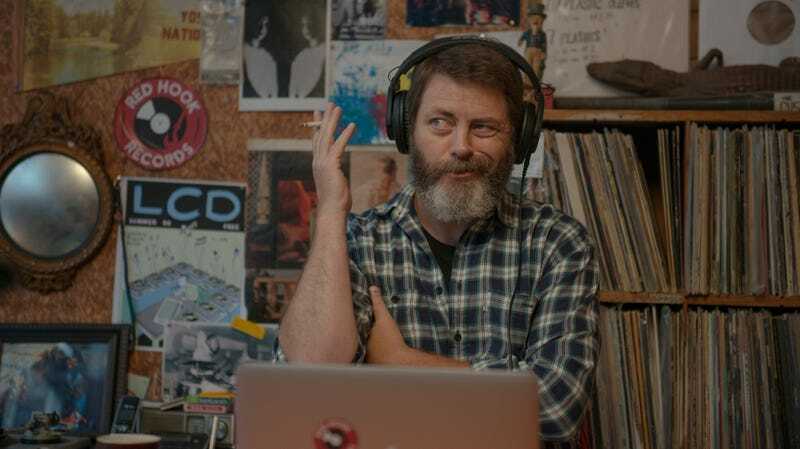 Frank Fisher (Nick Offerman), the widowed protagonist of Hearts Beat Loud, dotes on his teenage daughter. Also, he possesses a very particular set of skills. Unfortunately for Frank, his skill set mostly involves retail music sales, which makes him reliant on the tiny handful of people—even in trendy Red Hook, Brooklyn, where he lives and works—who still 1) buy albums and 2) don’t seek out cheaper deals online. As a young man, Frank had cut an album of his own, but his career never went anywhere; he still noodles around on various instruments (guitar, bass, drums) in his spare time, though, and has passed his love of music on to his only child, Sam (Kiersey Clemons), a talented singer who sometimes joins him in impromptu jam sessions. What if they were to form a band together? Granted, Sam’s about to fly across the country to attend UCLA, where she plans to study medicine. But is that really so important? Wouldn’t she rather stick around and help Dad belatedly realize his lifelong dream? Especially considering that Frank’s landlord (Toni Collette) recently raised the store’s rent, forcing him to close up shop. Multiple fences get straddled in this amiable indie drama, co-written (with Marc Basch) and directed by Brett Haley (I’ll See You In My Dreams, The Hero). Certain plot elements flirt with implausibility: After Frank and Sam jointly write and record the title song, Frank uploads it to Spotify, where it immediately, without any apparent promotion or effort, lands on a playlist so high-profile that Frank randomly hears the song playing at his local coffeehouse. Likewise, it’s hard to swallow the visit Frank subsequently receives from a label rep interested in signing We’re Not A Band (yes, that’s what they call themselves) for a record deal. On the other hand, nothing much comes of these unlikely developments, and the movie’s sensibility leans toward resigned realism. Are we meant to root for the band’s success—an almost irresistible impulse, given the rapport between Offerman and Clemons—or to be troubled by Frank’s willingness to torpedo Sam’s carefully planned life goals for his own benefit? Haley does his best to encourage and accommodate both responses, ultimately engineering both a rousing climactic concert and a pragmatic, almost downbeat solution to the central problem, but this seesaw approach feels like waffling rather than complexity. Still, the two leads make fine company. Offerman continues to expand his range well beyond Ron Swanson’s gruff über-masculinity, suggesting Frank’s arrested adolescence without indulging in broad man-child caricature. He’s well matched here by Clemons (Dope), who lends Sam a maturity beyond her years but also makes her credibly susceptible to teenage passion—not for rock stardom, but for her new girlfriend (played by American Honey’s Sasha Lane), who she’d have to leave behind in New York. Both stars apparently perform the songs themselves, too—catchy numbers penned by composer Keegan DeWitt. 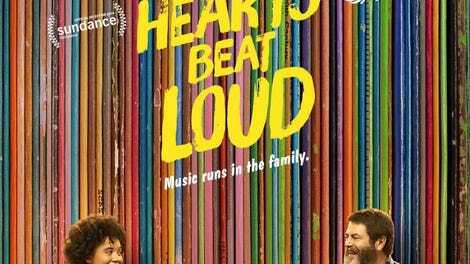 Hearts Beat Loud is smart, sincere, expertly performed (though Ted Danson, in a small role as Frank’s favorite bartender, gets little to do apart from echo Sam Malone), quietly progressive (Sam’s ethnicity and sexuality elicit no onscreen comment whatsoever), and just thoroughly… nice. What it lacks, in common with Haley’s previous films, is any real ambition, either visual or conceptual. Several dozen of these low-key, wishy-washy, mostly naturalistic creative bunts emerge from Sundance and South By Southwest every year. Precious few of them succeed in elevating viewers’ heartbeats.